Check out our new Facebook fan page. We have improved the functionality also, by integrating Facebook reservation widget. 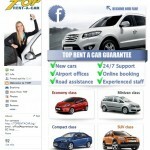 We have changed the design of our Facebook page and not only this, but also making your social network experience better by integrating booking widget for Facebook car hire reservation. Don’t forget to left your comments and feedback for your experience with our company!